This review was published by Shelf Awareness on November 29, 2015. 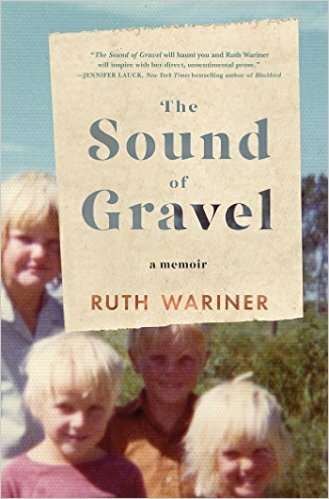 In The Sound of Gravel, Ruth Wariner tells of growing up in a Mormon polygamist colony in the state of Chihuahua, Mexico. Her childhood was filled with sad and shocking hardships, some painfully difficult to read. But Wariner’s tone is never self-pitying, and her love for her mother and siblings imbues a distressing memoir with nuance, and eventual relief. Ruth’s mother, Kathy, became the fifth wife of Joel LeBaron when she was 17 years old. Joel’s father founded Colonia LeBaron in Mexico because the practice of plural marriage was better tolerated there than in the United States. Ruth was Kathy’s fourth child and Joel’s 39th. He died just three months after Ruth’s birth–murdered by his brother over a conflict about church authority. Kathy remarried a man named Lane and bore another six children with him. Ruth was the eldest nondisabled female child and, over the years, many domestic duties, including childcare, fell to her. The Sound of Gravel begins with the family history of the LeBarons, whose status as church leaders impressed the young Ruth, and with Kathy’s personal history, as told to her daughter. The earliest scenes Ruth relates from her own memory find her at age five, and introduce her siblings: Audrey, the eldest, with a disability that remained undiagnosed for years and that led to occasional violence against the other children; Matt, a responsible boy; Luke, good-natured but developmentally delayed; and the baby, Aaron. Later the family grows as Meri, Micah, Leah, Elena and Holly are born. Lane, Ruth’s stepfather, promises to complete Kathy’s family’s dwelling and add a showerhead, electricity and other longed-for luxuries, but is slow to do so. Lane’s first wife and her children receive preference as to the basics, in the tradition of the LeBaron church. Ruth dislikes Lane early on, for his failure to support her mother as well as his harsh discipline. From an early age, Ruth sees her mother’s conflicts and jealousies with her sister wives, and worries that plural marriage looks more like misery than the holy state her church teaches it to be. The poverty and poor living conditions that come with Kathy’s choices are based on her religion, her devotion to and dependence on Lane, and a belief that the United States is a Babylon “standing between us and our connection to God.” Squeezing a living out of food stamps and Lane’s meager earnings–shared among four wives and an uncounted number of children–means mostly subsisting on beans and rice. The children are pulled out of school in their early teens–Ruth at age 14–because “Mom insisted that it was more important for me to be around to help her take care of the house and the kids.” But the most heartbreaking aspect of Ruth’s childhood is Lane’s sexual abuse, which continues for years even as Ruth repeatedly reports him to her mother. Kathy exhorts Ruth to forgive and move on; but even a town tribunal fails to stop the abuse. The community’s betrayal of its children is an especially disturbing phenomenon in a story filled with the tragedy and woes of day-to-day hardships of poverty, the absence of creature comforts, illness and accidental death. However, through it all flows Ruth Wariner’s careful, loving portrait of her mother, a woman doing her best with limited options, believing that her church knows best. Despite her profound anger at her mother’s failure to protect her from Lane, Ruth understands that she is loved, and deeply loves her mother in return. “I realized how little she had asked of the world, and how even that had been too much for the world to give.” She reflects that “Mom couldn’t teach me that because she didn’t know herself. She couldn’t show me how to be happy, only how to barely survive.” These and other contemplations establish Ruth as a wise and thoughtful narrator. The Sound of Gravel is straightforwardly told, in chronological order and with little lyrical adornment. Its power lies in the facts of the story, which is deeply affecting both in its horrors and in its redemptive conclusion. At the end, when Ruth saves herself and her sisters by escaping Colonia LeBaron, she has earned the reader’s sympathy and respect, and an identity beyond that of survivor. Rating: 8 babies (and counting). Come back on Monday for my interview with Wariner.